Whether you’re a homeowner or are responsible for the air conditioning system in a business or retail environment, there’s no denying that air conditioners are expensive pieces of equipment. You’ll do well, then, to service your air conditioner regularly to ensure you don’t end up paying for costly repairs further down the line. In this article, we list five excellent reasons why it’s so important to look after your air conditioner. When you get your air conditioner serviced, all the important parts of the machine responsible for filtering the air in your home, office or business are checked to ensure they’re still working at their optimum functionality. It’s also important to check that there is no air coolant being leaked into your conditioner, as this can have serious health implications. A simple service will make sure the air that you and those around you are breathing in is of the best possible quality. Expecting your air conditioner to soldier on with no servicing to check its health is not only going to be bad for your lungs but bad for your wallet too! It’s important to invest in servicing for your air conditioner to spot any potential problems early on, while they are easily fixed. Leaving simple glitches within your air conditioning system to fester will mean they become much bigger issues, that will eventually lead to your needing to replace the entire air conditioner! 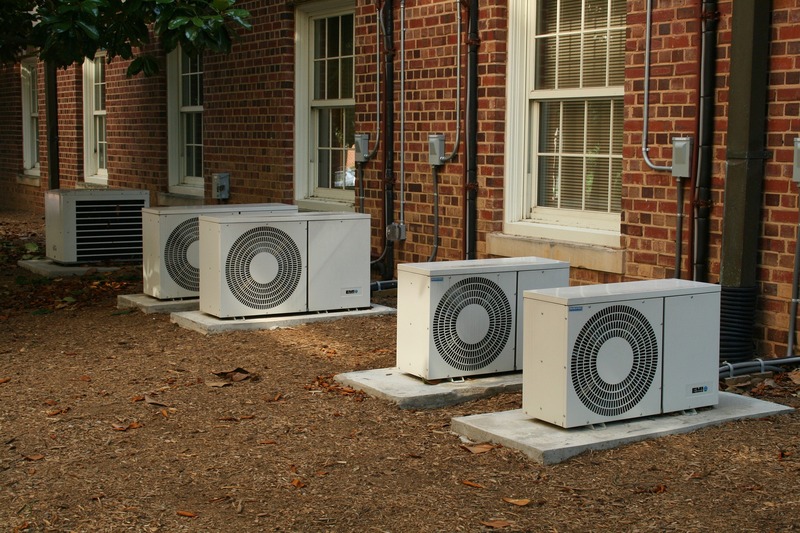 By regularly checking and caring for your air conditioner, you can ensure you’re meeting the important warranty stipulations that will allow you to get your money back with ease in the event of a bigger issue with your conditioning system. As a result, you’ll be able to get a new air conditioning system up and running in no time at all, keeping your family, employees or customers very happy. Manufacturers often require owners to perform regular aircon servicing and cleaning within their warranty specifications. When you’re running a large piece of equipment such as an air conditioner, there is sometimes a risk that it can become an energy-guzzling machine. However, this can be avoided easily through regular servicing. By getting your aircon checked regularly, you can rest assured that you’re doing your bit and contributing to your home or office becoming a greener space, thereby reducing the size of your carbon footprint. It’s also important to consider that not only will servicing spot any cracks in your machine’s energy efficiency early on and increase its practicality, but it will save you money on your fuel bill as a result, too. Perhaps the most important of all, getting your air conditioning system serviced regularly will give you the peace of mind to know that your aircon isn’t going to just stop working when you need it most. You can rest easy that your machine is fully functional, and that you’re getting the most out of your air conditioner. A couple of years ago, I wrote a piece about things you could do to beat the heat on a budget. Now that summer’s here again, I’d like to take that list a step further and give you a list of places you can go to get out of the heat that won’t cost a fortune. Many people don’t think about this, but it can often be less expensive to go out and spend a little money than the cost of running your air conditioner full blast for the day. If you don’t have air conditioning or if you’re tired of staying at home but want to go somewhere that won’t break your budget, here are some ideas. It’s cool and there are plenty of things to do that don’t cost anything. You can read books and magazines, play on the computers, participate in the activities, or just sit on a couch and soak up the cool air. The regular movie theater isn’t a bargain, but if you live near a discount theater, it can be a good way to see older movies cheaply. Some major theaters do offer summer specials such as kids get into certain movies/showtimes for free and these can be easy on your budget. (The adult usually has to pay full price, but that’s much cheaper than paying for an adult and two or three kids.) Call around and see what’s on offer in your area. Museums aren’t the boring, stuffy places they used to be. Many now have interactive exhibits, movies, and activities. Most museums are free, supported by your tax dollars. Some activities may cost extra, but the fee is usually nominal. And they’re air-conditioned. You may not have to pay a membership fee to join a pool or pay to build your own. Some communities have free pools and others charge only by the day, rather than making you pay for an entire season up front. During extreme heat waves, some may temporarily waive the fees altogether. Some gyms and health centers offer free trials of their services, including their pools. Maybe you’re lucky enough to have a neighbor with a pool who will let you use it while they’re at work. If you live in an apartment complex or neighborhood with HOA’s and community resources, you may already be paying for a pool. Use it. Many fast food restaurants have indoor playgrounds for kids. You don’t have to buy a full meal to use them, either. You can simply buy a couple of drinks, or an ice cream cone. The kids can play and the adults can kick back in the restaurant with a good book. If you don’t have kids, you can take your laptop or book to the local coffee shop and hang out there. Many won’t get upset if you don’t buy anything, but you can show your appreciation by buying a soda or cookie. Some larger cities or shopping plazas have areas where the kids can run through fountains. The ground is usually padded for safety and the fountains use sanitary water. Best of all, they’re free. If you live in a rural area, there’s probably a creek, lake, or pond that the locals use in the summer. 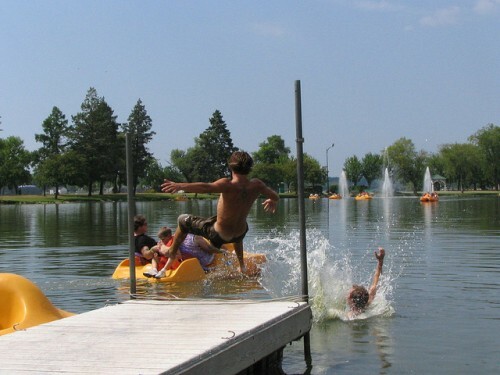 Just be careful because there can be lots of hazards and there are no lifeguards. If you are thinking about learning a new hobby or picking up some education credits, summer can be a great time. The classrooms are air-conditioned and classes are usually less crowded in the summer. The fees for community college and extension programs are reasonable and some are even free. If you live near a university, you may be able to attend some free lectures, especially if a visiting professor is in town. You may also be able to find some free appearances or readings by actors, authors, and other notables happening at bookstores or community centers. Check your city’s website or the local paper for details. If you have an ice skating rink nearby, check to see if they offer summer specials. Some offer reduced rates in the summer since ice skating is not a popular summer sport. Yet where better to beat the heat? If your friends have AC but you don’t, hang out with them. Don’t be a mooch, though. Offer to bring food, drinks, rented movies, or games to offset your couch surfing. Some local theaters offer free concerts and plays. Even the big-time symphony or theater group in your area may offer free or reduced price performances, especially for kids during the summer. You can also find other free music performances at local bars or coffee shops on open mic nights, or when an up and coming band is showcasing their work. If you’ve already got a membership that’s going unused, go spend some time in the gym. It’s air-conditioned and you don’t have to do anything more than take a leisurely stroll on the treadmill or hang out in the refreshment area while you watch TV. Many chain retailers offer free or very low-cost activities, particularly for kids. Just be sure to attend the activity but skip the impulse buying so you keep it budget friendly. Not just for Sunday mornings. Many churches offer exercise groups, book clubs, craft groups, or fellowship groups which are free and usually happen in the AC. Some mega-churches even have their own coffee shops and bookstores where you can get in out of the heat. There are a number of manufacturing companies that give tours of their facilities. If you happen to live in an area that has a large company headquartered there, check to see if they give tours of their plant. it will get you out of the hot sun and you’ll likely learn some things about how something you buy is created. It’s often a great way to entertain the kids as well. If you really want to find someplace cool when the sun is out, head for the nearest cave. Many caves can be found in national and state parks, and there are private company cave tours as well, although they tend to be a bit more expensive. If you live in an area that has a lot of caves, you might even go exploring on your own. Just be sure to have the proper equipment and emergency supplies if you decide to choose this option for escaping the heat. If you want to do some hiking even with all the heat, by picking the right trail you can stay relatively cool. The general rule is that the higher altitude you go, the cooler it will be, and you can escape the heat by picking trails that are shaded by trees. Hikes that go through tree covered canyons are always a good bet to be a lot cooler than an open trail. For this one to work, you need a car that has air conditioning. To make it budget minded, you also would need to have some errands that you needed to get done (as opposed to just driving around with no purpose) that requires a lot of time spent in the car and not much outside. If you have been meaning to visit relatives a few cities away, or pick up something that is a few hours away, a hot day may be the perfect time to schedule this. The mall is a wonderfully cool place to visit during the summer, but only if you’re extremely disciplined. They offer a number of interesting activities, but if you don’t have the discipline, unplanned purchases can derail your budget. If you can go and just window shop, though, it can be a cool afternoon. Similarly, avoid full-blown water parks, full service playground restaurants like Chuck E Cheese, and full priced movies. These things are fine to do once a summer or so, but if your goal is to save money, they should be used sparingly and not as a regular way to get out of the heat. Fortunately, there are plenty of other places to go to get out of the heat for free or on the cheap. It is the middle of August. That means that if you live anywhere in the continental United States, it is probably a lot hotter outside than you would like. With temperatures in the 90’s and 100’s across much of America, staying cool becomes a very serious pursuit. Staying cool without breaking the bank becomes even more of a focus. Our home has central air conditioning. It actually has two AC units, one for the master bedroom and one for the rest of the house. I have no idea why the original owner (from whom we purchased the house) included two AC units in the house but it makes little difference to me. We just won’t use it unless someone runs a summer fever and needs to be in a cooler room. My kids like to tell me that I am a freak because I do not feel the heat. I just don’t mind it. I would much rather be in a hot climate than a cold one and I certainly don’t want to pay a premium in order to chill my house enough to justify putting on a sweater (which seems to be the goal of my elder son). That said, there are a lot of ways that people can stay cool without having or paying for air conditioning. Draw your Shades or Shutters: If you draw your shades or shutters, especially on the dark side of the house, you will find that your home is much cooler. Growing up in Massachusetts during the energy crisis – in a home without air conditioning – our house was always cool because it was always dark during the summer. Keep the sun out and you will keep the heat down and manageable. Turn off the Lights and other Appliances: Light bulbs generate heat. The more lights you leave on in your house, the more heat you will generate. The same is true for televisions and other large appliances. Keep them off whenever possible and you will find that your house cools off as well. Also, do not put any heat sources near your thermostats. That will cause your AC unit to think that it is hotter in the room than it really is. Use Fans: We have ceiling fans in every room of our house and they do wonders to keep us cool. You may not have ceiling fans, and you may not need them if you live in an area that is not warm year round, but any kind of fan will be sufficient. The fans will generate a small amount of heat because they do have motors, and they won’t actually cool down the temperature in your room, but they will make you feel cooler the way a breeze will cool you down outside. Feed the Family without Turning on the Oven: Use smaller appliances like toaster ovens and crock pots. Better yet, take your cooking outside and use your grill if you have one. Just don’t turn on your oven and have it heating your kitchen to 400 degrees when it is already hot enough. Make sandwiches or toss a salad with some tuna. Take Advantage of Swimming Opportunities: Swimming pools are very expensive. Chances are good, however, that you can take advantage of a swimming pool that you do not have to maintain. If your community or subdivision offers a pool, try to cool off whenever you can by taking a swim. If a local gym has a swimming pool, the pool alone may be enough to justify a membership!